The pompom is back and better than ever! 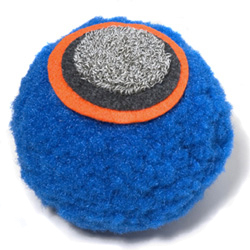 This fun and fuzzy five-inch puff is actually a unique electronic sensor that controls a lamp's light levels. With just a gentle tap you can turn on, off or dim any existing incandescent or halogen lamp. Add a splash of excitement and whimsy to any room. Installation is easy. Just plug your lamp into the Super Pom Lamp Dimmer, then plug the Pom into the wall. Perfect for a child's room, end table or nightstand, the Super Pom will delight all ages!